The Islamic Republic continues squandering Iranians’ most vital resource: the energy that could drive their prosperity and fuel their future. Washington D.C., October 30, 2018 — As Iranians experience a deteriorating economy, sinking currency, and rising joblessness, a new study published by Omid for Iran and the University of Utah’s Hinckley Institute of Politics lays out a clear and devastating case of widespread corruption in Iran’s oil and gas sector. This corruption led to the loss of more than $1 trillion to the wider economy during the Ahmadinejad presidency alone and continues to contribute to the ongoing suffering of the Iranian people. “Where Is My Oil? Corruption in Iran’s Oil and Gas Sector” shows how “corruption by design” plagues Iran’s oil and gas industry, enriches members of competing “oil mafias” and elites close to the government, while endangering the future of Iranians. 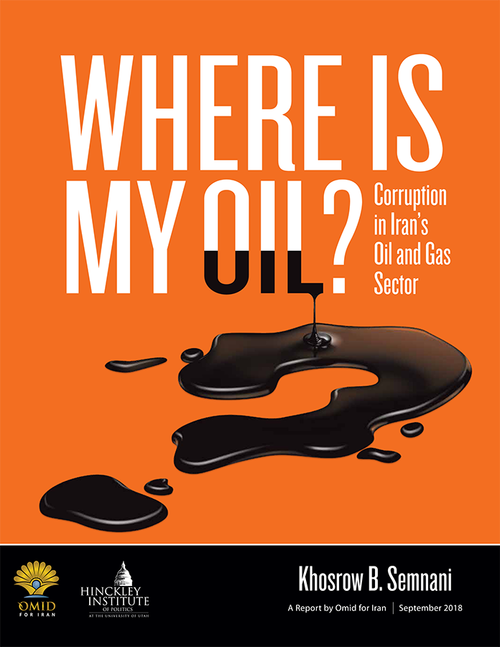 Authored by prominent Iranian-American business leader and philanthropist, Khosrow B. Semnani, with a supporting group of specialists under the independent, not-for-profit organization, Omid for Iran, the report paints a picture of an oil and gas industry under siege by “a persistent system of corruption” that has led to dramatic underperformance of the Iranian economy. Deploying a social accounting matrix (SAM) multiplier model from Iran’s own Parliamentary Research Center, the author shows the devastating and real impact of missing oil revenues on the lives of ordinary Iranians. “Where is My Oil?” represents a clear-headed call from a prominent Iranian-American to all Iranians worldwide and those who love and support the future of the Iranian people to take a closer look at the tremendous damage wrought by corruption in Iran’s oil and gas sector. Omid For Iran is a nonprofit organization which aims to improve the lives of ordinary Iranians by promoting individual freedom, empowering civil society and advancing good governance. See www.omidforiran.org. The Hinckley Institute is a nonpartisan institute at the University of Utah dedicated to teaching civic responsibility. See www.hinckley.utah.edu. The report will be available for the public to download on Oct. 30, 2018 at WhereIsMyOil.org. Selections in Persian will also be available for download, with the full translation to follow later.